I resolve to get organized. 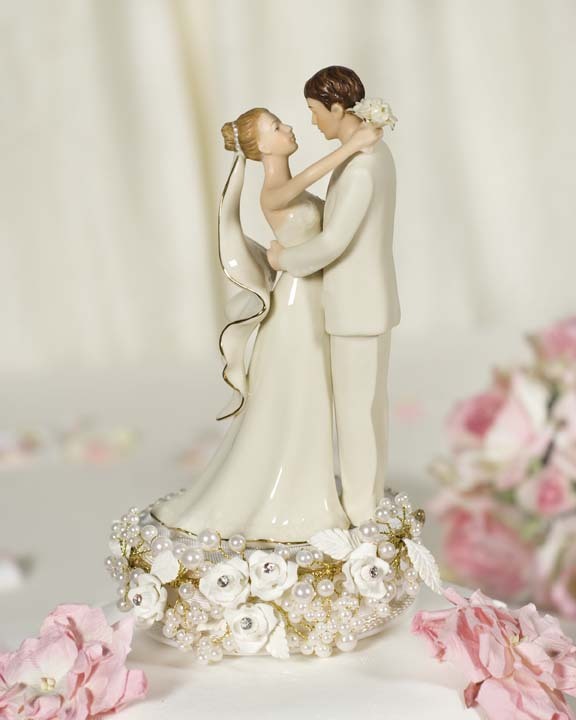 If you have been putting off getting all your ducks in a row for your 2010 wedding—whether because you’ve been too busy, or simply become mired in an overabundance of choices—now is the time to buckle down. Create that wedding web site; make a wedding binder that contains your wedding planning checklist, inspiration images, vendor information, contracts, etc. 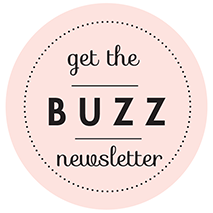 ; hire a coordinator, if you haven’t already; ditto booking your wedding site. I resolve to get in shape. It’s a common New Year’s resolution—and one that many resolvers tend to forget about after a month or two. But not you, Houston bride. This year, you’re going to find a fitness routine that works for you and stick to it. You’re going to walk instead of driving, take the stairs instead of the elevator, take money out of your budget for a personal trainer, take up yoga, maybe even take on the Marathon Oil Tower. You’re going to get fit, have fun doing it, and look absolutely spectacular in your wedding gown. No excuses. I resolve to take good care of myself. While you’re working out, slimming down and buffing up, don’t forget that a beautiful bride is a healthy bride—in body, mind and spirit. Along with that weekly exercise regimen, you want to make sure you are getting the right nutrition, and nourishing yourself with periodic massages, facials, spa treatments, acupuncture—whatever it is that works best to reduce your stress level, raise your energy and sustain you through the demanding and exhilarating process of planning your perfect wedding. I resolve NOT to go over budget. Sure, spring peonies would look divine at your December wedding. And wouldn’t it fabulous to have foie gras and French champagne for your cocktail reception? As for those custom crystal-encrusted tablecloths/hand-lettered invitations/Louboutin pumps—aren’t you worth them? Of course you are. But if you keep spending a few more bucks here and a few (hundred) more bucks there, just to make sure you have the latest, greatest, most luxurious, designer-est EVERYTHING for your wedding, or jumping at every little lovely that’s waved in front of your face, you’re soon going to find yourself (or your parents, as the case may be) stretched thin financially, or, at the very worst, driven into deep debt. So indulge, pamper, honor the magnitude of the day, even live out your fantasies—but do so within your means, so that happily ever after is within your reach. I resolve to be a good bride-to-be. We’ve all encountered at least one sweet, kind, easygoing, reasonable girl who is transformed, Hulk-like, into a demanding, temperamental, impatient, totally unreasonable beast by the process of planning her wedding. Please, please promise, right here and now, Houston bride, to avoid this fate in 2010. Be thoughtful and generous with your bridesmaids, patient and empathetic with your parents (and your groom’s), reasonable with your vendors, and, most importantly, understanding with your fiancé—after all, he’s your partner not just in the journey toward marriage, but for life. Show him the woman you are, and the wife you will be: kind, strong, fair, wise and always, always full of love. Happy New Year, Houston bride. Their client list—Colin Cowie Lifestyle, Versace, Bergdorf Goodman, Serena Bass, etc.—reads like a who’s who of arbiters of style and sophistication. 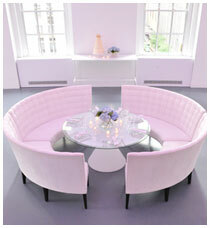 They’ve provided spectacular props and furniture for everything from Hollywood film shoots to high-end social affairs. And now New York’s famed Taylor Creative Props has launched Taylor Creative Weddings—a special collection of furnishings, accessories and décor, along with design consultation services, tailored (if you’ll pardon the pun) just for weddings. Perhaps even YOUR wedding, Houston bride. Taylor Creative has a distinctly modern aesthetic, marked by architectural edge, mid-century modularity, plenty of glass and chrome, and lots of sleek, bright white. But when paired with beautiful lighting and floral, these edgy pieces soften gorgeously, and evoke an atmosphere of sophisticated femininity and romance that makes us swoon. 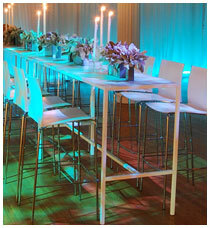 Our favorite pieces include the Victoria Pattern Ghost Chair (especially when paired with the patterned Cube Table ), the tufted white Windsor Collection and the illuminated Plexi Bar. 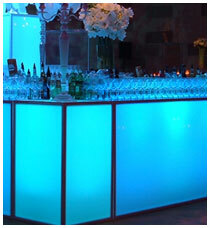 And how about those fabulous Glo Balls for an evening al fresco reception? Unfortunately, Taylor Creative does not warehouse items in Houston—BUT, they will send whatever you want via truck from New York (for the right price, of course). 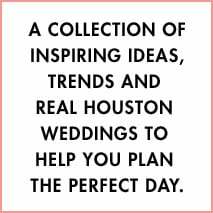 For the rest of us, the Taylor Creative Weddings’ site is a source of inspiration and ideas, and a GREAT resource to share with our phenomenally talented Houston wedding consultants, rental companies, florists or décor providers. If you’ve spent any time researching Houston wedding floral vendors, you’ve almost certainly heard Lisa Tran’s name. For years, she has been one of the most sought-after florists in town for weddings and special events. Now Tran has opened a linen gallery, dubbed Linen Gallery, which boasts a large selection of tablecloths, chair covers, and just about every other linen you might need to accent your special day. She’s also changed the name of her company from Floral Impressions (previously Wedding Flowers by Lisa) to Blooming Gallery. 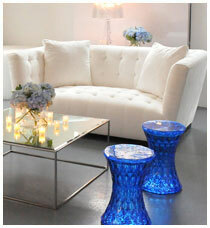 Both the linen shop and floral studio are now located at 1510 Delano in Houston. Don’t let the name change fool you: Lisa still offers the same great service and level of quality that’s led Houston brides to have her handle all of their floral needs for years, and we’re guessing that her full-service linen shop will quickly become one of the most popular places to call for luxurious linens. At Linen Gallery, Houston brides can choose from a large selection of unique linens that includes just about every design and color imaginable. 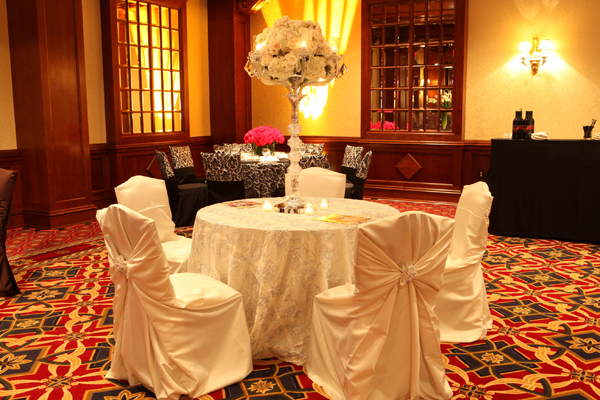 That includes some gorgeous sequin designs that are sure to make your reception sparkle. And if you can’t find linens that are everything you imagined, don’t worry. 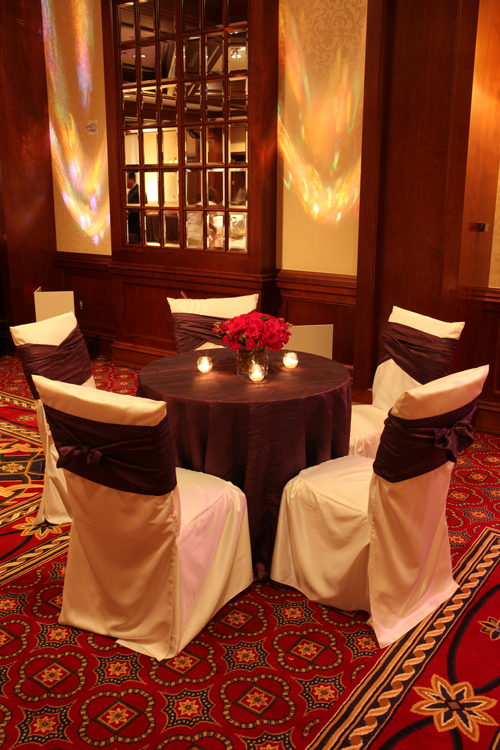 Lisa can hook you up with some custom-made linens designed just for you. Pretty fabulous, right? Honestly, we’re not surprised: Lisa is known for taking her each of her brides to the flower market to make sure she gets exactly the flowers they want—in exactly the hue they want, and she’s committed to ensuring that Houston brides get exactly the linens they want. “Quality is all that matters,” Lisa tells us. “Most brides only have one wedding, so I want to give them service they remember when they talk about their wedding.” We’ll toast to that! 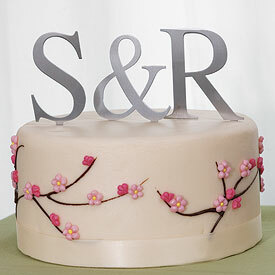 Simple, elegant, white-on-white wedding cakes are making a major comeback, especially for the coming spring wedding season…which is great news for cake toppers. If you’re leaning toward understated elegance, have a look at some of our top choices in toppers—a fine finishing touch for your perfect cake. 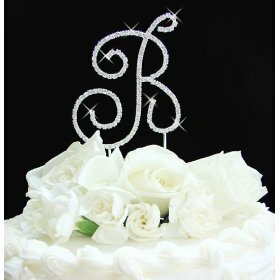 There’s something about the way crystals catch the light just so… Add sparkle to your cake with this sterling-silver-plated, Swarovski-crystal encrusted cursive initial topper, available in every letter of the alphabet. 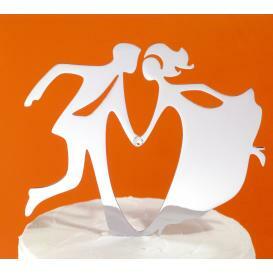 If you and your groom are part of dancing craze that’s sweeping the country, let this cake topper express your passion. The silhouette shapes are contemporary and cool, the polished silver look is sleek, the overall effect is energetic and fun! Clean, simple styling and brushed silver give these monogram letters a hip, contemporary look we love. Vintage cake toppers are in vogue, and this off-white porcelain bride-and-groom style is one of the prettiest we’ve seen. 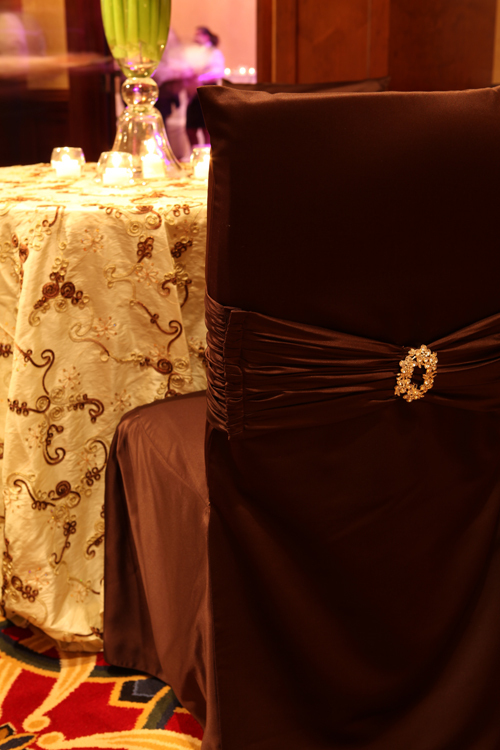 We especially like luxe touches like the faux pearls, rhinestone-studded roses and 24K gold trim on the bride’s veil. 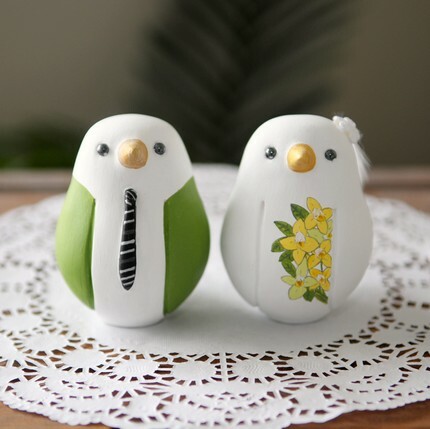 We are utterly in love with these handmade love birds. Customize your pair by choosing the groom’s tie style, bride’s veil style (birdcage, feather headpiece or full veil), and wing colors. Add-ons include a hand-painted bouquet and 6-inch-wide Spanish-moss nest. More Wedding Shoes—This Time in Color! We love the idea of adding a splash of unexpected color to our wedding ensemble, and this coming season there’s no better way to do so than with a pair of brilliant-hued bridal shoes. Choose shoes to match other accessories/details (sash, embroidery or beading, jewelry, etc), or set your colorful shoes against a backdrop of pure white or ivory. Either way, you’ll make a stunning statement as you make your way down the aisle. Like a burst of sunshine, the brilliant yellow suede Demille by Joan & David makes for a beautiful springtime surprise, especially with that sweet little flower accent at the vamp. How about this lilac lovely from Max Studio? 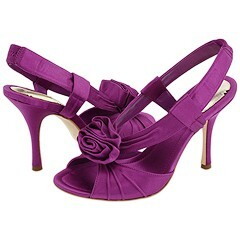 That shimmery satin, that romantic rosette, that sturdy slingback strap with built-in elastic (dancers, take note! )—perfect to pair with an ivory or champagne gown. Nobody does red like Valentino. And there’s no red Valentino wedding shoe like the Bow Couture Pump. 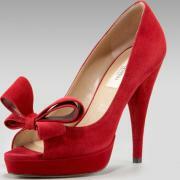 In rouge suede with covered platform, peep-toe and sculptural bow. Chic, bold, brilliant. This one from RSVP is called the Lovely, and we can see why. That crystal-encrusted heel? Fabulous. Comes in hot pink, too. 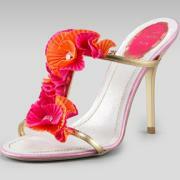 Last but not least, the Floral Ruffle Sandal from Rene Caovilla is a destination bride’s dream. What could be more celebratory, more sophisticated, than the combination of gold leather, fuchsia/orange floral and crystal detail? What could be handier than the extra set of heel tips that come included with your pair?